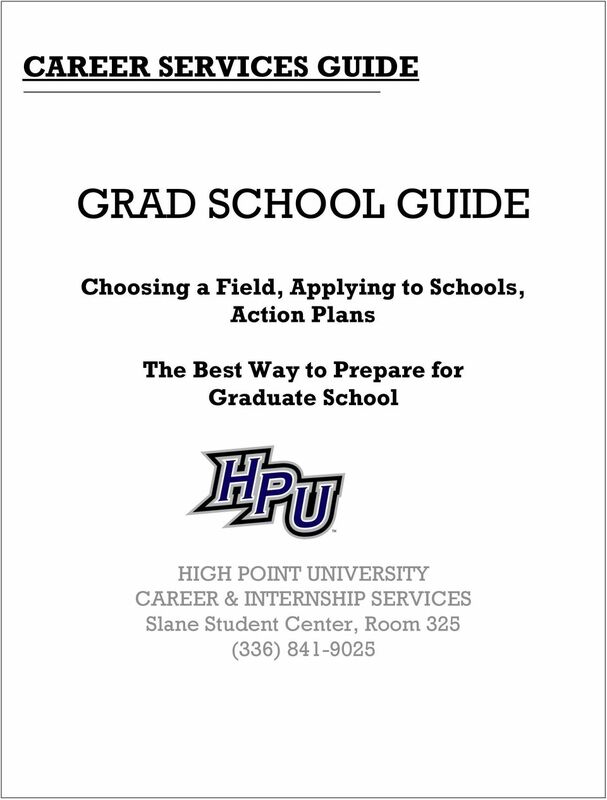 Download "GRAD SCHOOL GUIDE. Choosing a Field, Applying to Schools, Action Plans. 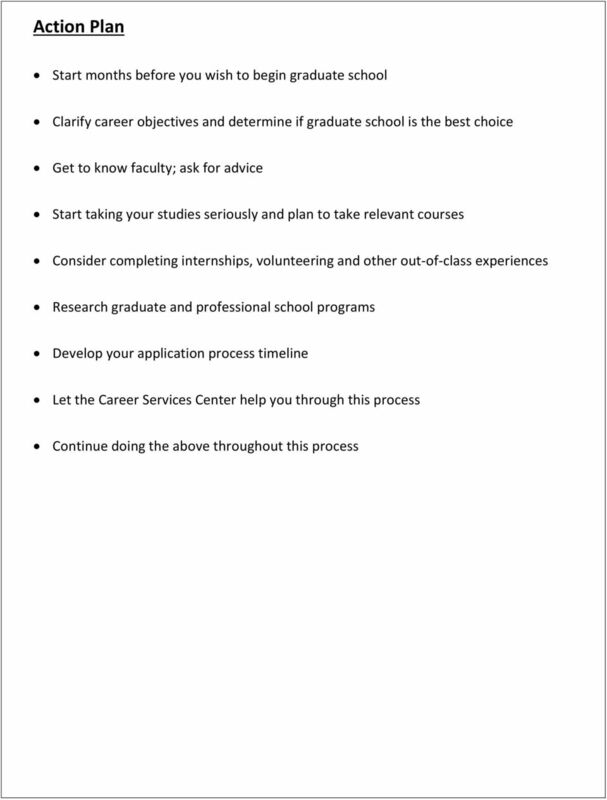 The Best Way to Prepare for Graduate School"
3 How Many Schools to Apply To? 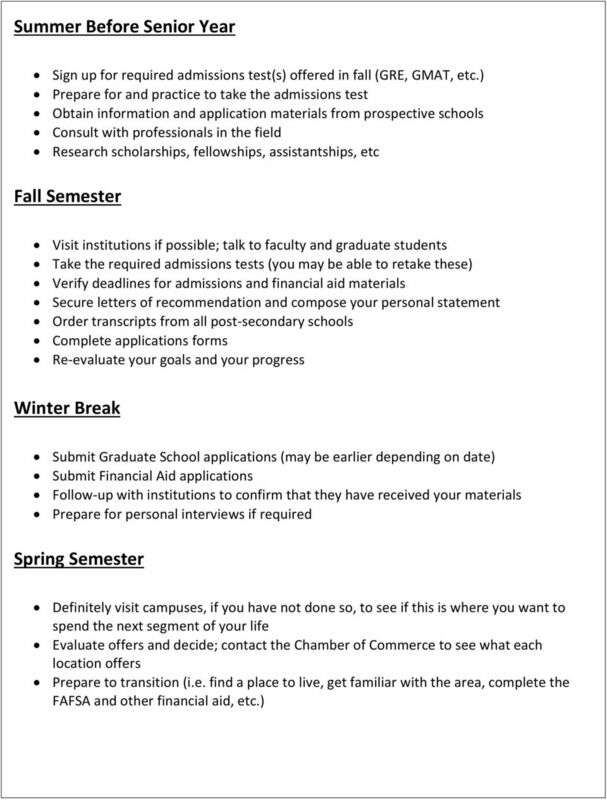 It is common to apply to several schools. This depends on your qualifications, willingness to relocate, field of interest, etc. Apply to a range of the following categories: One or two extremely desirable programs w/ competitive admission standards One or two realistic programs that meet your needs. 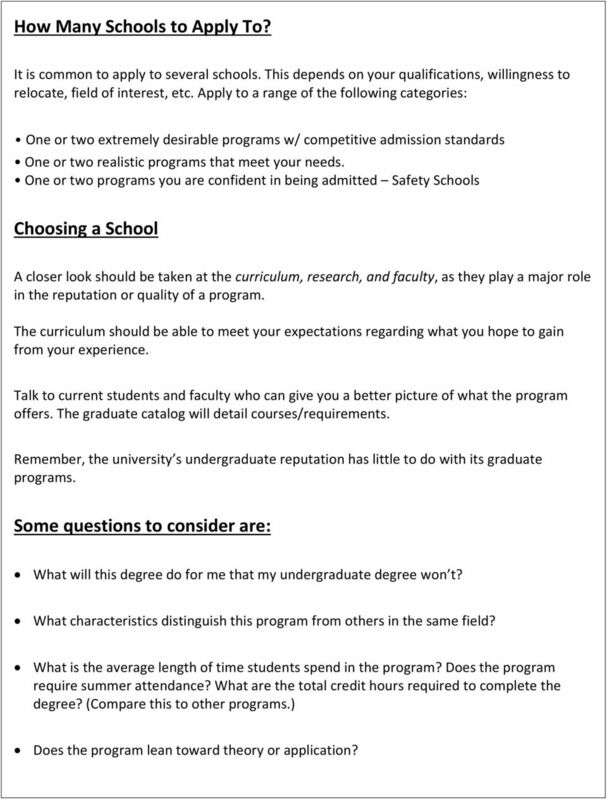 One or two programs you are confident in being admitted Safety Schools Choosing a School A closer look should be taken at the curriculum, research, and faculty, as they play a major role in the reputation or quality of a program. The curriculum should be able to meet your expectations regarding what you hope to gain from your experience. Talk to current students and faculty who can give you a better picture of what the program offers. 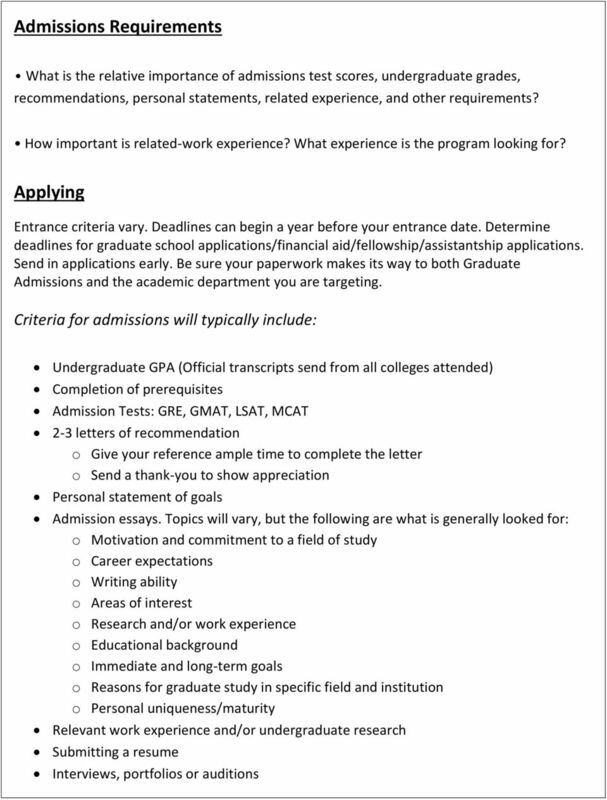 The graduate catalog will detail courses/requirements. Remember, the university s undergraduate reputation has little to do with its graduate programs. Some questions to consider are: What will this degree do for me that my undergraduate degree won t? What characteristics distinguish this program from others in the same field? What is the average length of time students spend in the program? Does the program require summer attendance? What are the total credit hours required to complete the degree? (Compare this to other programs.) Does the program lean toward theory or application? 4 Is the program accredited? (i.e. certified by a national board) What opportunities for leadership are provided? Does the program require a thesis, dissertation or passing comprehensive exams? What planned practical experiences are included in the program? (Ask for examples of internship placements.) What percentages of students in the graduate program attend full time vs. part time? What is the level of student retention? What is the student satisfaction with program? Consider student gender/ ethnic diversity, academic ability, and professional accomplishments of graduates. 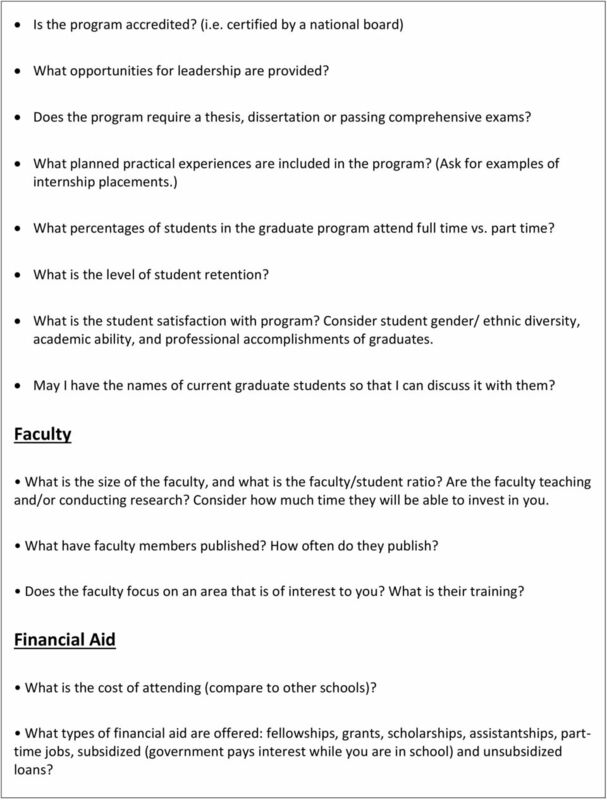 May I have the names of current graduate students so that I can discuss it with them? Faculty What is the size of the faculty, and what is the faculty/student ratio? Are the faculty teaching and/or conducting research? Consider how much time they will be able to invest in you. What have faculty members published? How often do they publish? Does the faculty focus on an area that is of interest to you? What is their training? Financial Aid What is the cost of attending (compare to other schools)? 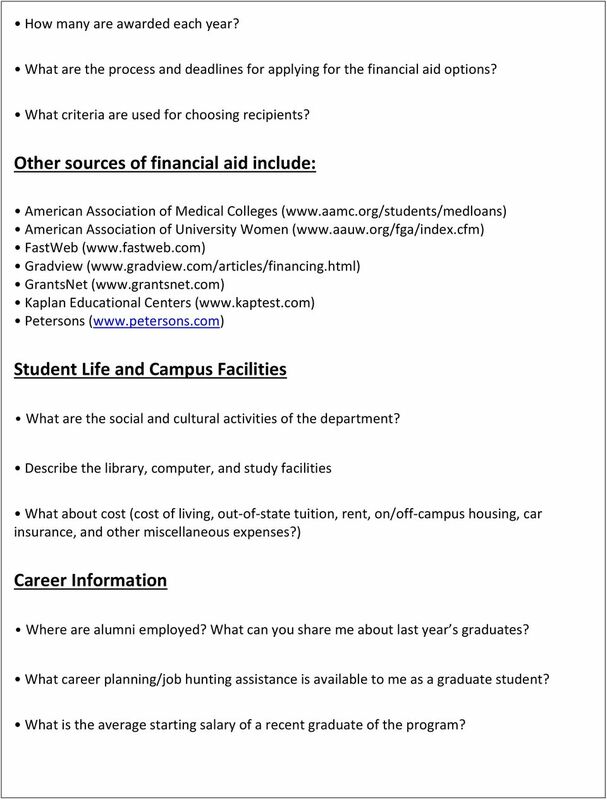 What types of financial aid are offered: fellowships, grants, scholarships, assistantships, parttime jobs, subsidized (government pays interest while you are in school) and unsubsidized loans? 5 How many are awarded each year? What are the process and deadlines for applying for the financial aid options? What criteria are used for choosing recipients? Other sources of financial aid include: American Association of Medical Colleges ( American Association of University Women ( FastWeb ( Gradview ( GrantsNet ( Kaplan Educational Centers ( Petersons ( Student Life and Campus Facilities What are the social and cultural activities of the department? Describe the library, computer, and study facilities What about cost (cost of living, out-of-state tuition, rent, on/off-campus housing, car insurance, and other miscellaneous expenses?) Career Information Where are alumni employed? What can you share me about last year s graduates? 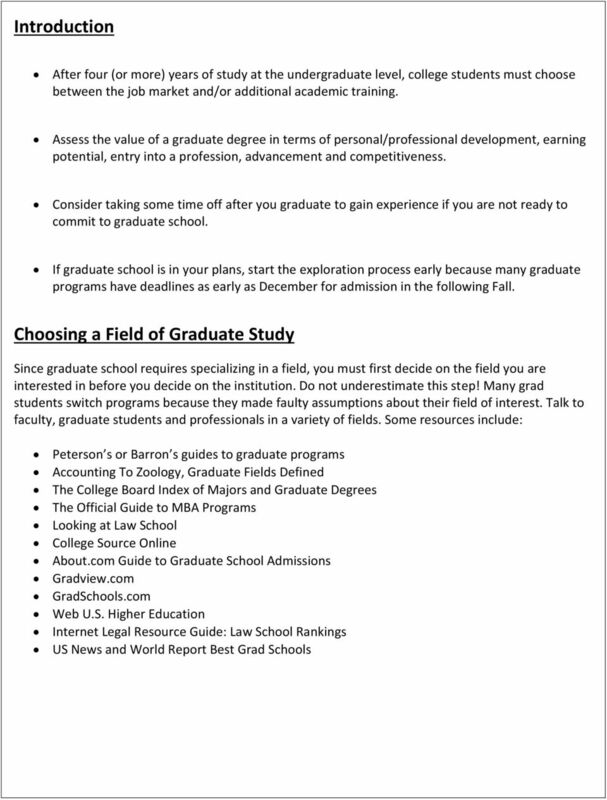 What career planning/job hunting assistance is available to me as a graduate student? What is the average starting salary of a recent graduate of the program?